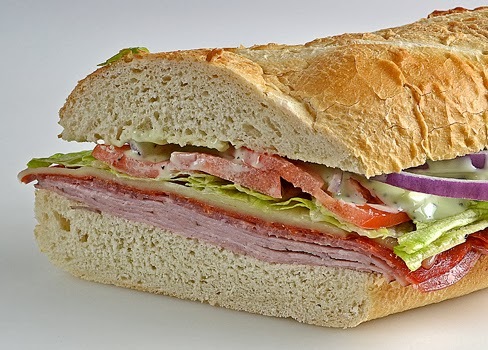 Originally I had planned to make a giant toasted sub, cut it into about 15 slices and present it as a Super Bowl Italian Grinder. I layered the meat and cheese, toasted it, threw on the fresh LTO and smothered it in Kraft's Green Goddess sauce. Once I closed it shut and sliced it I knew there was a problem – bread overload! It was tasty, but I did eat it without the top portion of the bread. The loaf I had chosen was a large fresh baked french bread, the only problem was that I need 2 to 3 times the amount of meat on it to balance the sandwich. I should have went with a lighter, fluffier bread, or just made several individual sandwiches with sub buns. There was nothing wrong with it flavor wise, which is why I'm sharing it here. Usually I would make a custom sauce for something like this but I wanted to give the Goddess Sauce a test, and I must say it passed with flying colors. It reminds me of a creamy Italian or Caesar dressing with a little extra pepper or spice. It was a great compliment to the meats I had chosen and I'm going to try and keep this on hand to use as a special sandwich sauce when I'm in a pinch for something nice. It's not that expensive and an easy thing to keep in the pantry for the occasional saucy surprise. Cut bread in half length-wise. On bottom piece layer ham, salami, pepperoni and cheese. 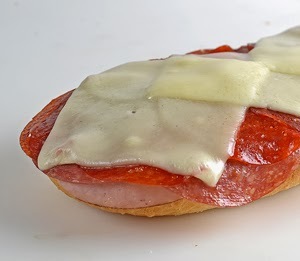 Place in oven with top half of bread along side and cook until cheese is melted and bread is toasted, 5 to 6 miniutes. Remove from oven. 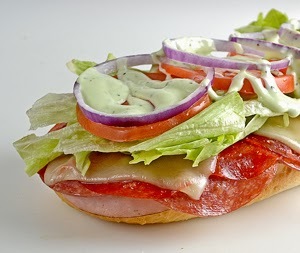 Add lettuce, tomato, onion and Green Goddess sauce, and top with bun. Then serve, if using a larger loaf for bread, slice before serving.